In his day job Bill Yan is responsible for 600-plus prisoners as the superintendent of the Alice Springs gaol. 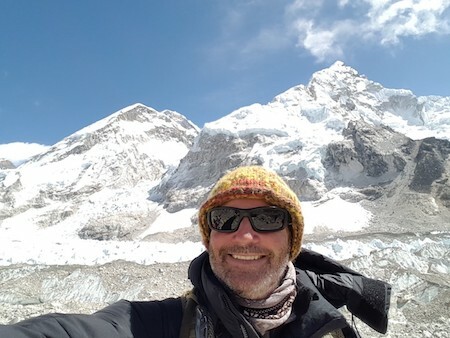 On his days off he likes climbing a hill, as he puts it, which recently turned out to be a two-week ascent to the base camp of Mount Everest in Nepal. He was in a group of 11, including a 65-year-old Swiss woman, all of whom finished the trek. Half of a second group trekking with them, eight people in their twenties and thirties, had to be choppered out. Every climber has to carry a US$500 emergency fund for evacuation by helicopter, if necessary, and that’s decided on the basis of daily health checks, especially oxygen content in the blood. The lowest Mr Yan’s went was 81% but one climber of the other group was down to 50%. 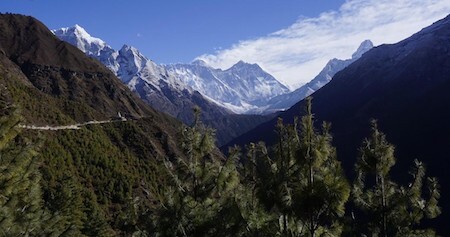 Mt Everest, even just to the base camp, is not for the faint hearted, nor the unprepared. The starting point was Lukla in a lush valley, a town which Mr Yan enjoyed comparing to Alice Springs when he spoke to the Rotary Club of Alice Springs last night: A small isolated place, surrounded by magnificent mountains and with tourism as its main business. But that’s pretty well where the similarities ended. The group traversed through 2500 vertical meters in temperatures as low as -22 degrees. Acclimatisation breaks are built into the walk, consisting of resting one day, doing an up and down stage on the second, and continuing on the third. There are no roads, just tracks, and everything has to be carried – by people or by animals. And that’s where the Sherpas came in more than handy. They are an ethnic group from Tibet famous for their immense strength: A 70kg man can carry as much as 100kg on his back. Mr Yan says in the walking group, the tourists carried a 5 to 10kg pack, the Sherpas, 25kg. The physical strength serves the Sherpas well not only in tourism, but in their normal daily life. In one Sherpa village called Phortse, Mr Yan saw a woman in her 80s tilling the ground with a hoe to grow Nepal’s finest potatoes, bringing twice the normal price – after being carried to market on someone’s back, of course. He saw a 10-year-old girl, not wearing shoes, in 10 degrees below zero, walking to a well to fetch 20 litres of water for the family. There is no broad welfare system in Nepal. The Sherpas are partly self sufficient through their agriculture and herding yaks, which are also beasts of burden. The walk through valleys and along glaciers is exceptionally beautiful, as Mr Yan’s images showed, with the mountains covered in eternal snow and ice always on the horizon. But it is also hard and dangerous, with shrines all along the trek marking spots where climbers have fallen to their death. PHOTO at top: Mr Yan near the base camp. Mount Everest is the 2nd peak from the left over his right shoulder. Well done boss. A very determined and capable man at the top of his game.